Over a year in production This Album is a tribute to the Great Song Writers of the past. 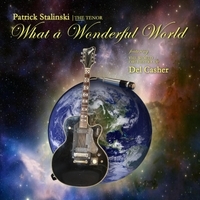 The world renowned Guitarist and Producer Del Casher created12 unique new arrangements of these Cover song standards in 12 distinct new styles. Frequently compared to the musical talents of Luciano Pavoratti, Andrea Bocelli, Michael Bublé and Josh Groban, Patrick Stalinski, a tenor vocalist and actor in Los Angeles, CA has been celebrated by the industry for his rare voice and versatility. Patrick has had decades of unique experience performing professionally in various forms of entertainment including theater, film, television and music. Today, Patrick continues to perform and record as well as teach new and advanced singers alike how to finely tune their voices. While Patrick's early career focused on classical sacred performances, his real passion is to re-create traditional music in new ways. For those who would not normally listen to classical music, he strives to give them a taste of the music's power and still feel like they are listening to something new. He sometimes describes the genre-stretching style of his first two albums as, "classically-flavored new age pop." A rare, natural tenor, Patrick's range and versatility are evidenced throughout his work. From Bach Cantatas to Broadway tunes, he's even dared to sing Denver, bringing audiences to tears with his own rendition of Annie's Song. He is a torch song tenor, a la Rondstadt's 'Round Midnight, but with the power and passion of Pavarotti. His voice will truly mesmerize you and he's extremely patient and versatile when working with others.